It’s time to say Hello to the new Wolfgang Puck Bar & Grill! 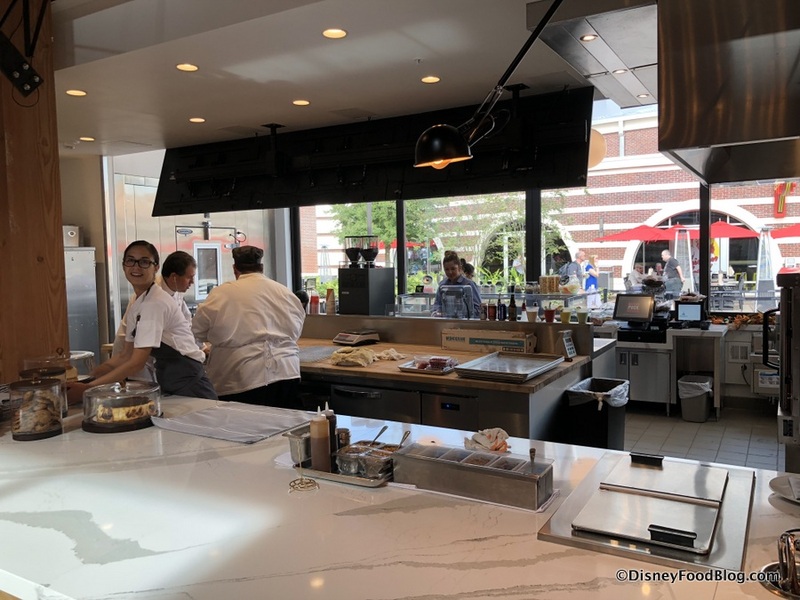 So we’re very excited to be at Wolfgang Puck Bar & Grill to experience once again the Chef’s California cuisine… with some twists from Wolfgang Puck himself — on its opening day! The difference from the previous Wolfgang Puck Cafe is immediately striking. Obviously, the location is different, but I’m more referring to the modern, fresh feel of the building itself. Let’s just say the previous Cafe wasn’t known for its “modern day appeal.” (You can see the Cafe here.) 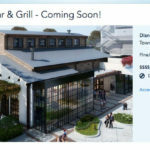 But the Bar & Grill has an entirely new feel and identity! Stepping inside, pops of red leather immediately stand out against more neutral tones. It’s kind of like a big barn in here, right? 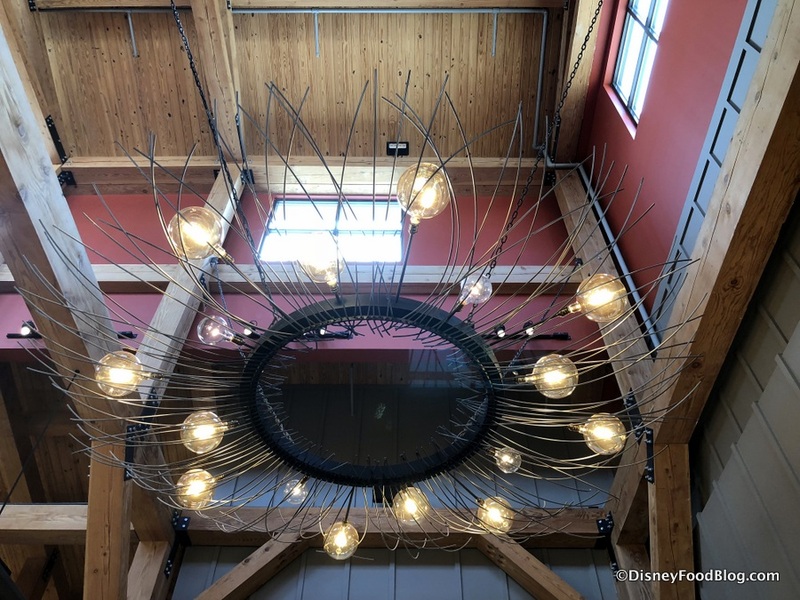 And in regards to seating, there is space to host large groups in addition to what you see above. Even with the clean and simple choice of colors, there is plenty to lend visual interest to the location, from exposed wood beams to cool light fixtures which provide more ambience even against the sunlight coming in from the plentiful windows. 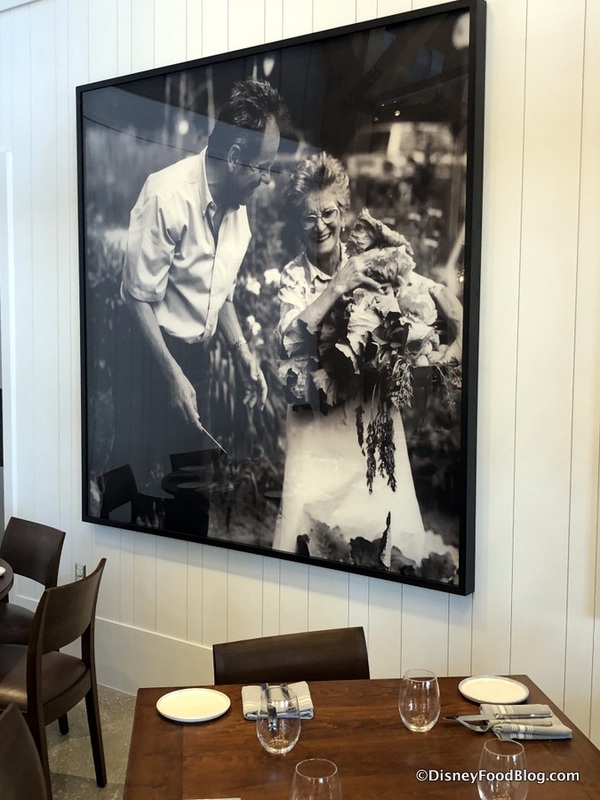 Black and white portraits add personal touches to the dining room. And some put the emphasis on fresh ingredients. 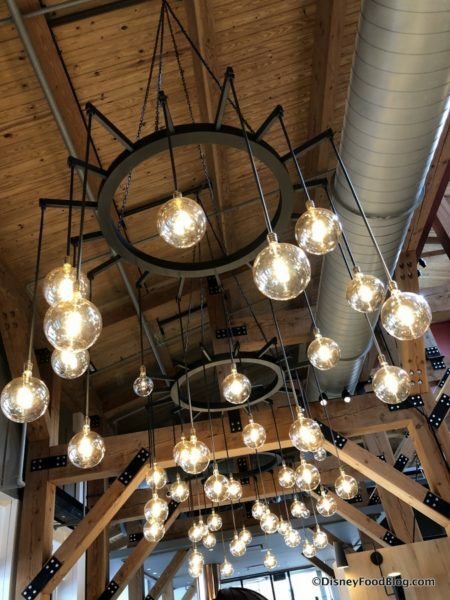 But other things that certainly draw the eye — an whet the appetite! — are the open kitchens in the space! 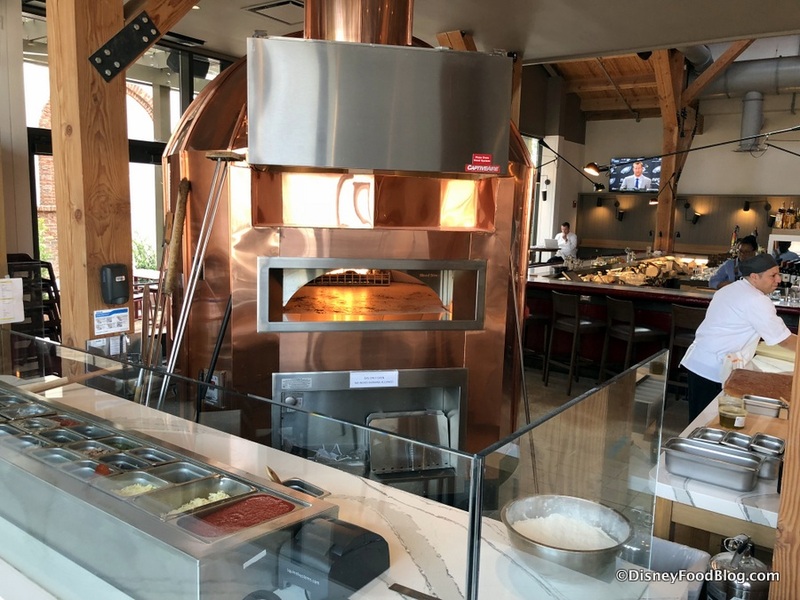 The pizza kitchen is to your left upon entering. Check out the oven, all fired up and ready to go! 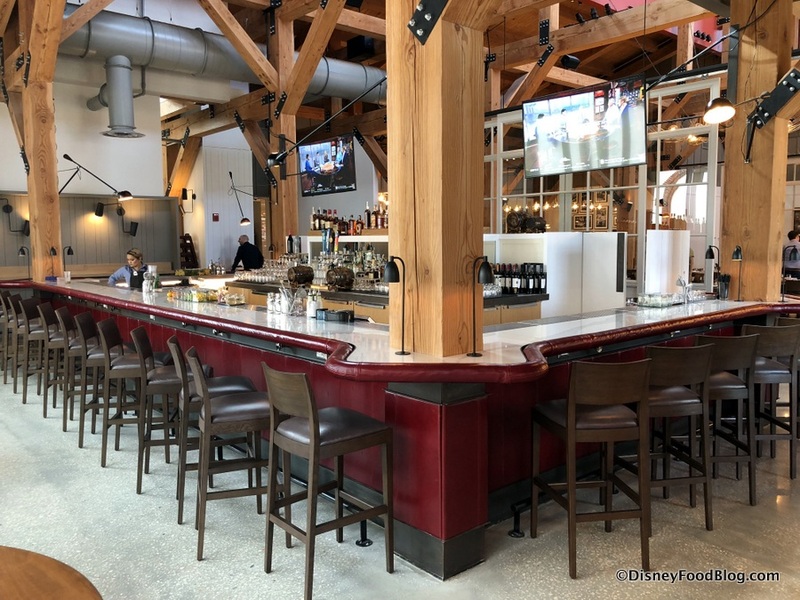 The main open kitchen is in the back of the restaurant if you would like to see the goings on. 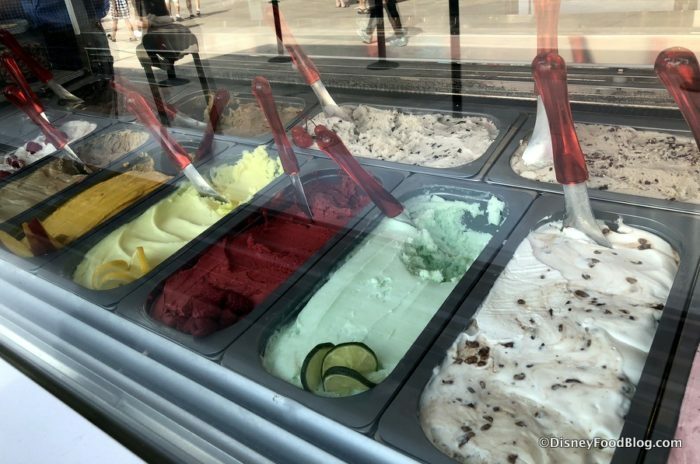 And then, there’s the GELATO BAR!!! 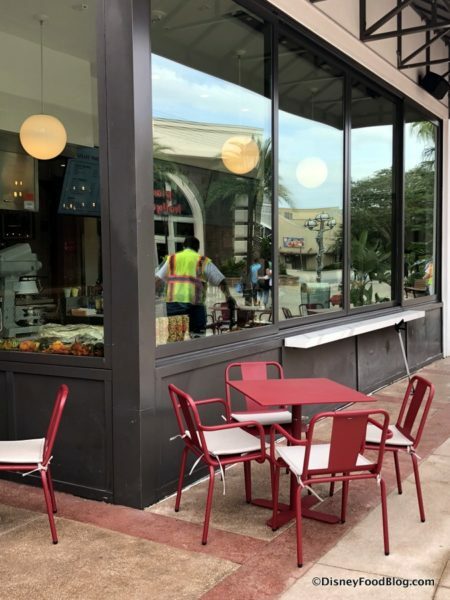 It’s combined with the bakery area, and you’ll see it to the right as you walk in. But you’ll be able to access it from the outside… because it’s a WALK-UP WINDOW! 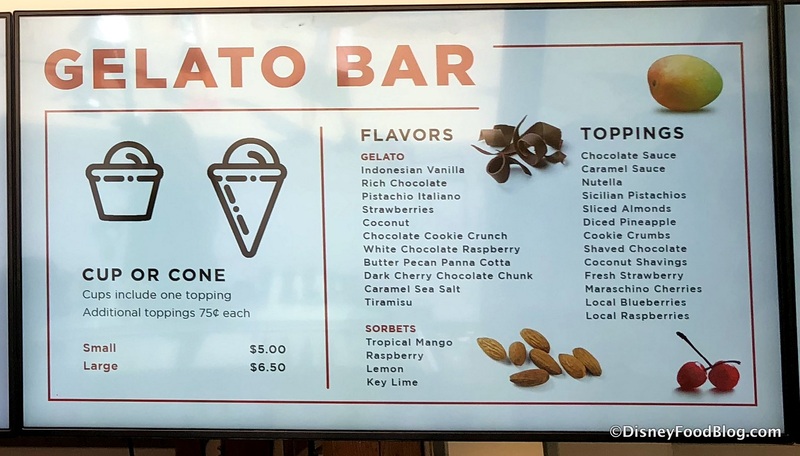 No Advance Dining Reservation needed for the gelato bar. And there’s no more need to wait for us to dig right in! 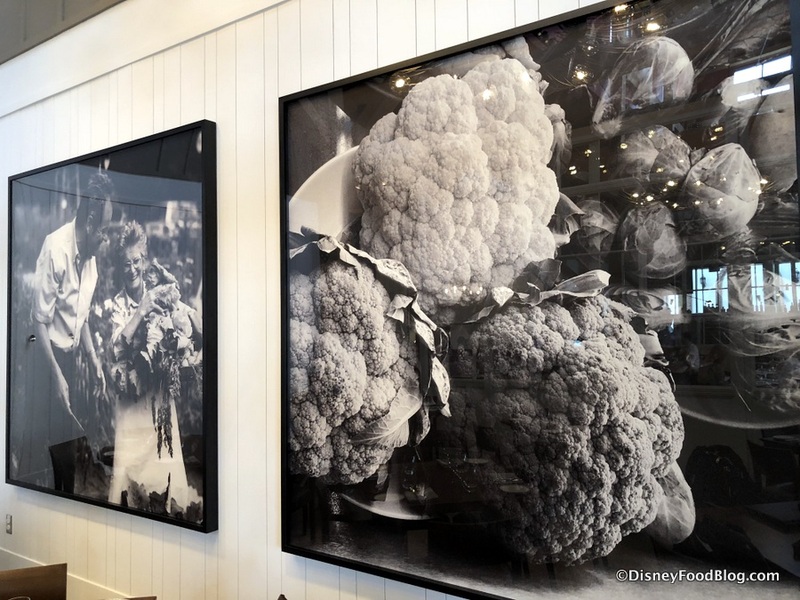 The menu for Wolfgang Puck Bar & Grill has likewise received a fresh makeover while retaining some classic favorites. And while you may think the selections might be limited under the simple heading of “California cuisine,” there is plenty of variety tucked into the menu. 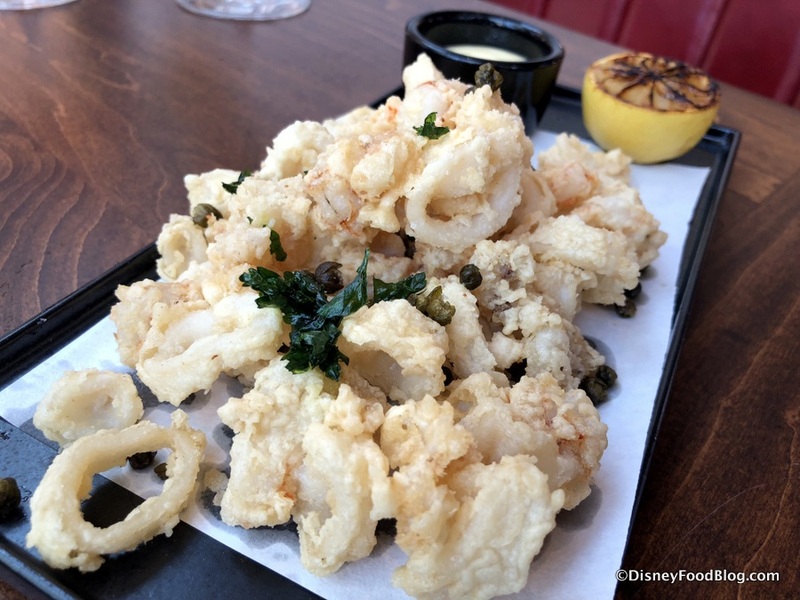 Starters can be enjoyed in two ways: with options To Share for the Whole Table and individual Appetizers and Salads including Grilled Tandoori Chicken Wings and Tempura Calamari & Shrimp. 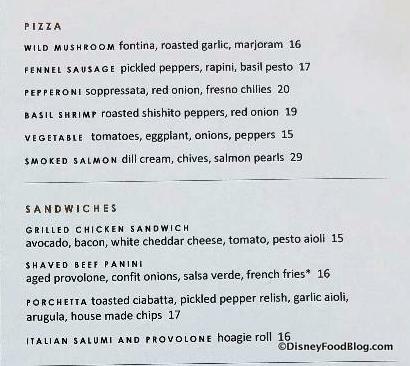 Of course, Pizza is on the Lunch menu, while Sandwiches include a Shaved Beef Panini and Porchetta. 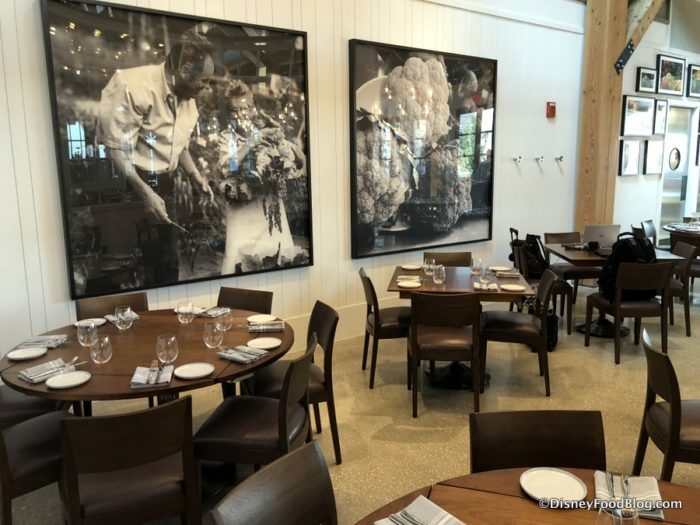 Pasta selections feature Puck’s famous Pumpkin Ravioli and a Seafood Risotto. Entrees for lunch include the WP Burger and Chicken Schnitzel. And we definitely had our eyes on the Mesquite Grilled Steak Frites. 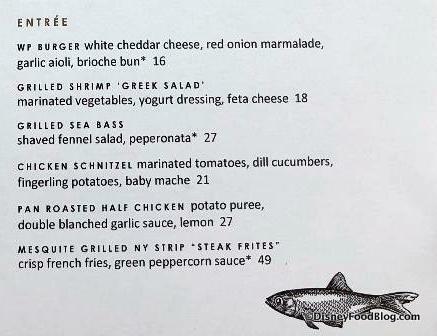 Note that I was intrigued by the Pan Roasted Half Chicken on the menu. 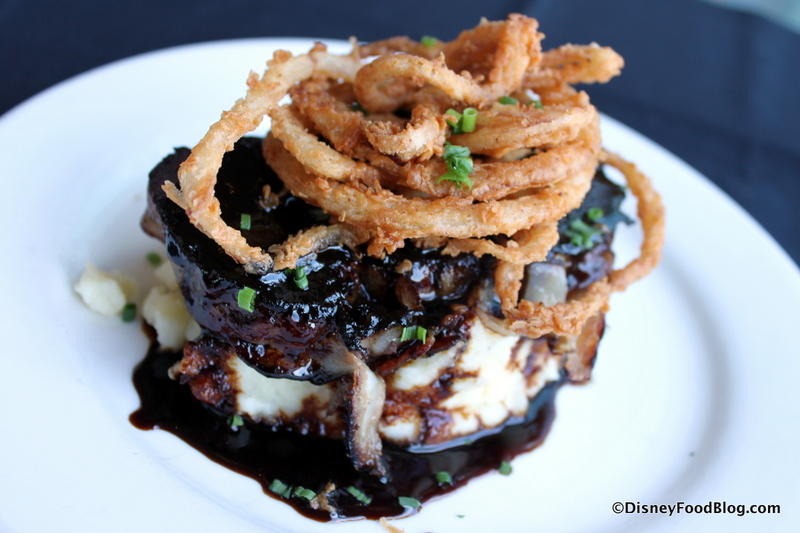 You can get a similar dish at Wolfgang Puck Express (rotisserie vs pan roasted) and it’s delicious. So I’m not sure why you’d pay $11 more for it here. 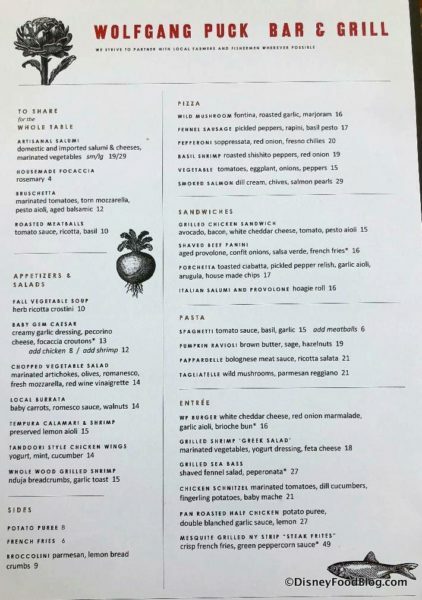 Maybe I’ll order it and compare the two on my next visit, but I just wanted to make you aware of that — if you can’t decide between the half chicken and another entree here, grab the other entree and have lunch later in your visit at Wolfgang Puck Express for the cheaper half chicken. A la carte sides include Potato Puree and Broccolini. 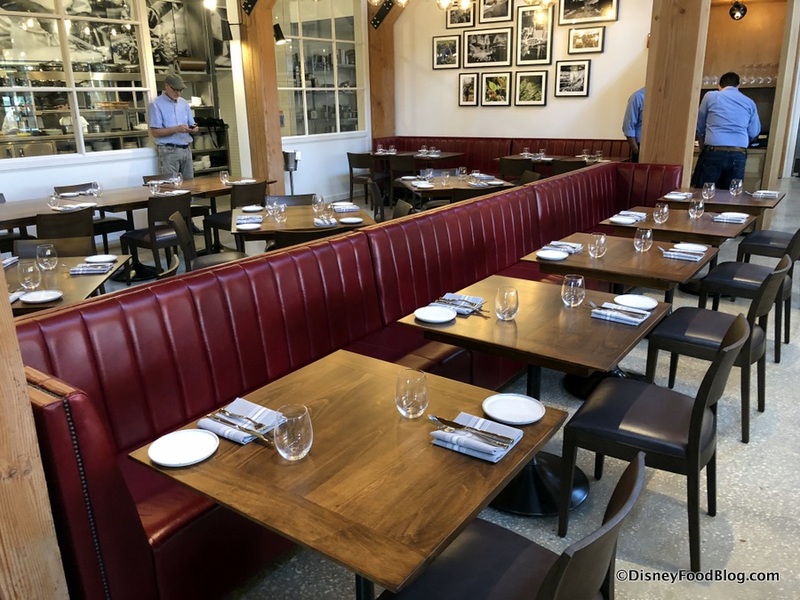 Again, our visit was for lunch, but Dinner will also feature a selection of Platters including a 32-oz Porterhouse Steak for Two, Porchetta, Chicken Schnitzel, and an Olive Oil-Seared Red Snapper. Children can choose from Cheeseburgers, Pizza, Grilled Cheese, and the like. There are also more unique options like Bacon Wrapped Meatloaf for the kiddos. Aside from an abundance of Hand Crafted Cocktails, the Artisanal, Draft, and Craft Beers present some domestic options from Florida and California (among other states and Imports), which is fun considering the Chef’s California cuisine and longtime history with his locations here in Florida. Our choices from the cocktail menu (left to right in the picture below) were the Lilly Belle, named for Walt Disney’s wife, of course; the Garden of Eden; and the Papa Doble. The Lilly Belle was a slightly sweet, sophisticated drink with gin, aperol, sparkling rose, and lemon. It was my favorite of the three. 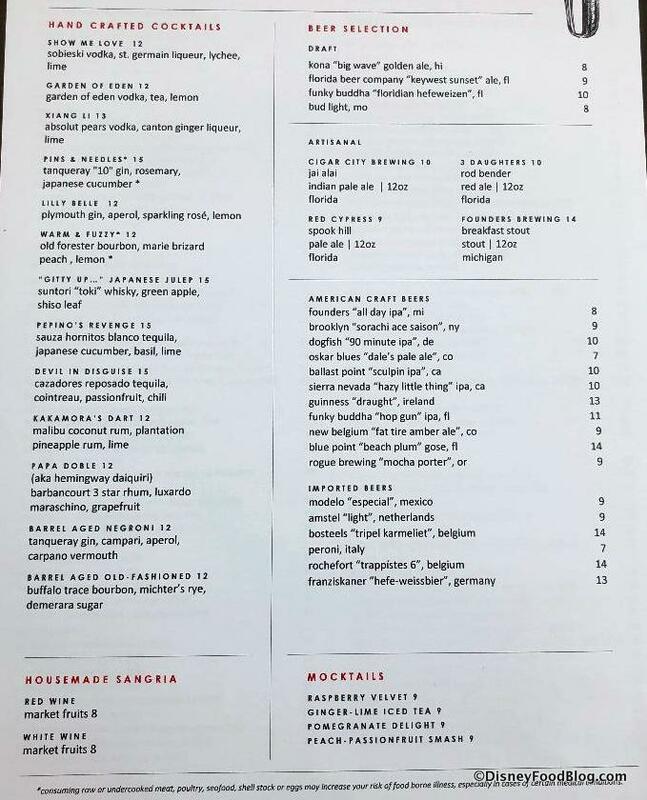 The Garden of Eden includes house-infused vodka, tea, and lemon — like a “grown-up Arnold Palmer” according to the bartender. It was decent, but a little watered down by the ice once I got to drinking it. It had a distinct “sangria” feel to it. And the Papa Doble (aka Hemingway Daiquiri) featured rum, maraschino, and grapefruit. This one was tart and bitter, and the strongest of the three. We chose the Artisanal Salumi (this is the small portion) from the Shareable options to begin our meal. 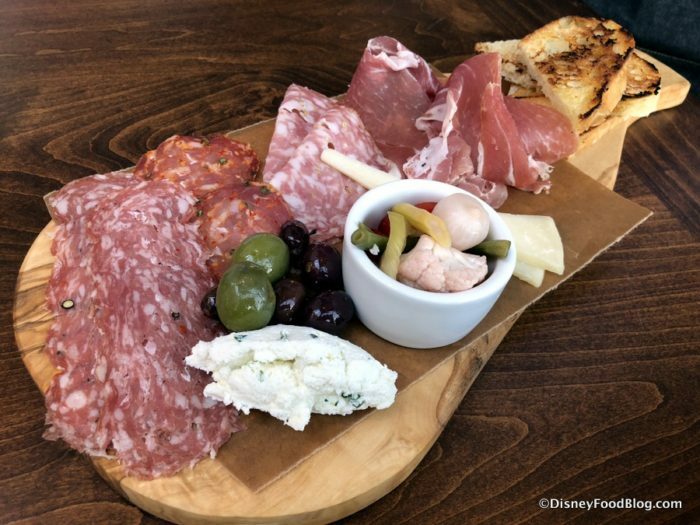 The meats across the board were plentiful and flavorful. But I found the cheese selection and portion to be lacking as you can see. We could have used more of the cheeses that we got, and at least one other variety would have been nice. And while you know I love my cheese and almost never met a cheese plate I didn’t like, I’m sure by looking at the photo you’ll see that its not just my cheese-bias doing the talking. There just wasn’t enough to it. 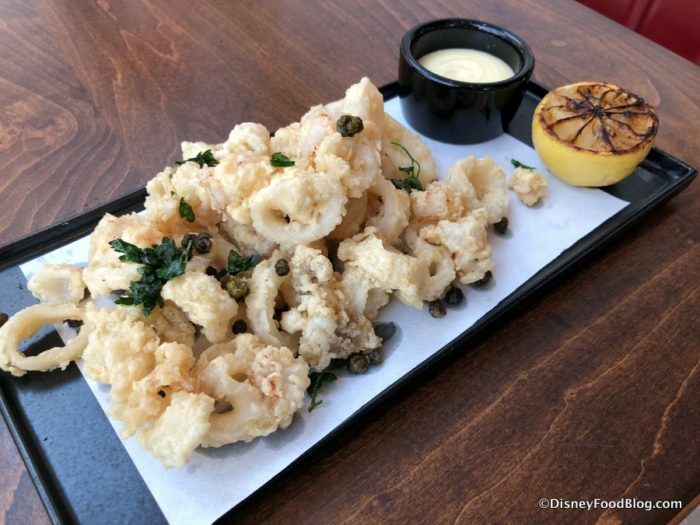 Fortunately, things really started looking up with our individual Appetizers, which included the Tempura Calamari and Shrimp. True, it’s kind of hard to mess up Calamari. But I have to give credit where its due for the really terrific, flavorful breading on the dish, with the tempura nice and crisp all around. We also ordered the Local Burrata (a soft Italian cheese). Here it’s presented with baby carrots, a romesco sauce, arugula, and walnuts. 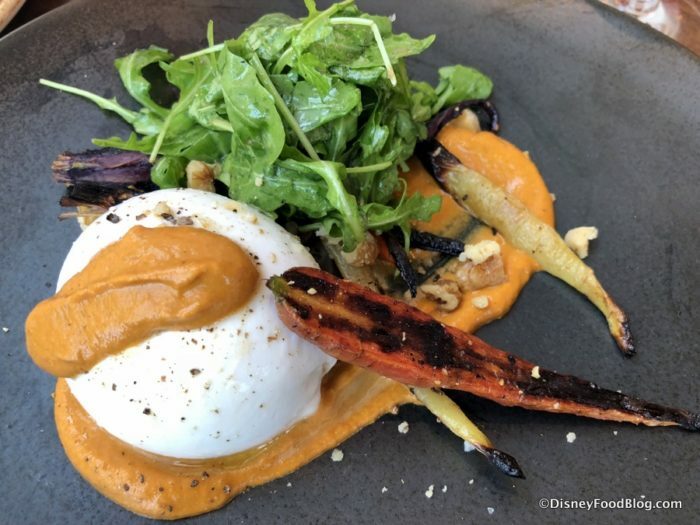 This was excellent, with the incredibly creamy cheese making up for what was lacking on the Salumi board, the peppery romesco puree adding plenty of zest, and the crunch from the walnuts offering some texture variation. 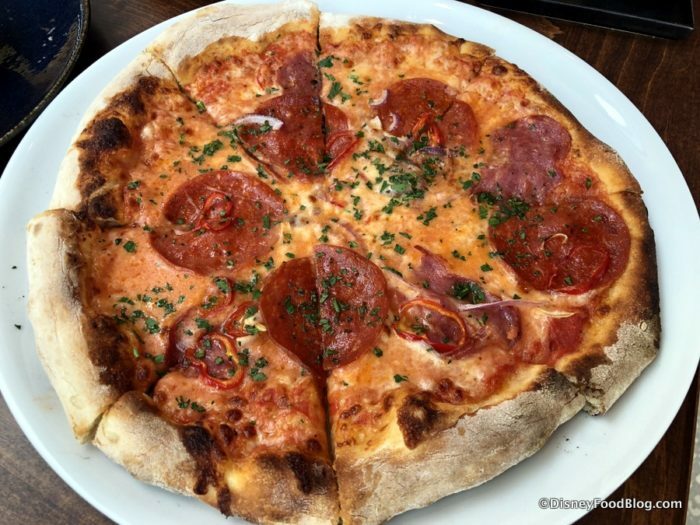 We couldn’t go without ordering a pizza at a Wolfgang Puck restaurant, opting for the Pepperoni Pizza, further topped with red onion and fresno chiles. Unfortunately, this one was pretty forgettable. While I enjoy the pizzas you can get at Wolfgang Puck Express, this wasn’t much different and ultimate didn’t stand up against the rest of the dishes. So, if you’re hankering for some Puck pizza, I’d say grab some in the Marketplace. The Pasta, on the other hand? Well, we’ve got two to share with you. 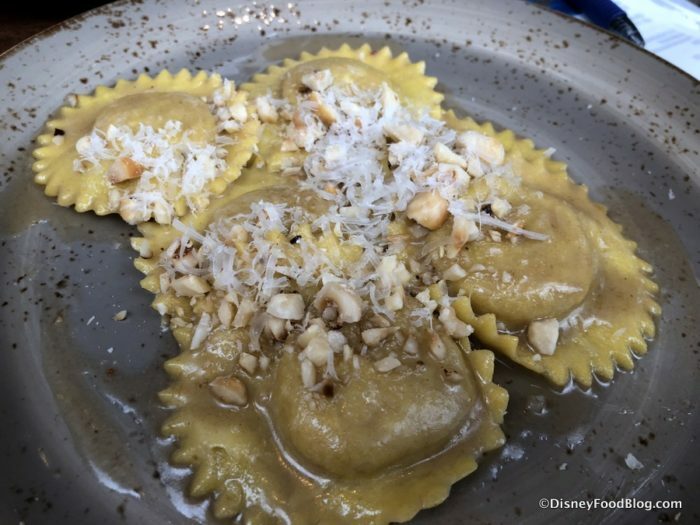 The Pumpkin Ravioli is accompanied by brown butter, sage, and hazelnuts (an interesting choice over pumpkin seeds) for an autumnal dish. It is truly unbelievable. SO SO good. 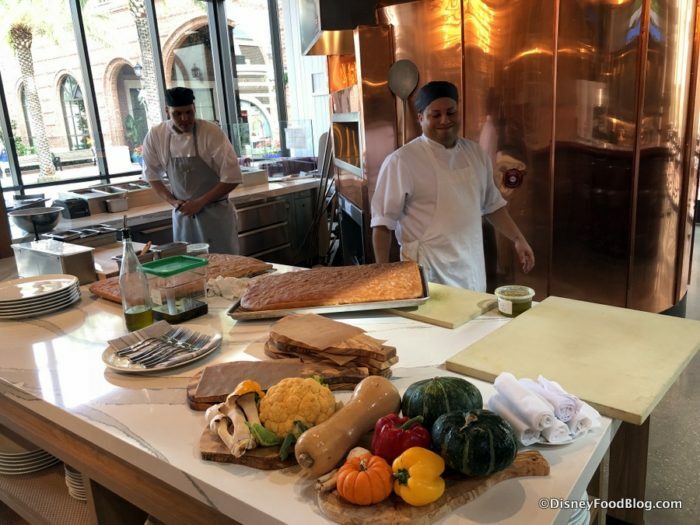 Puck is famous for his autumnal raviolis (butternut squash is also a favorite flavor to include), and there’s a reason. This stuff is killer. 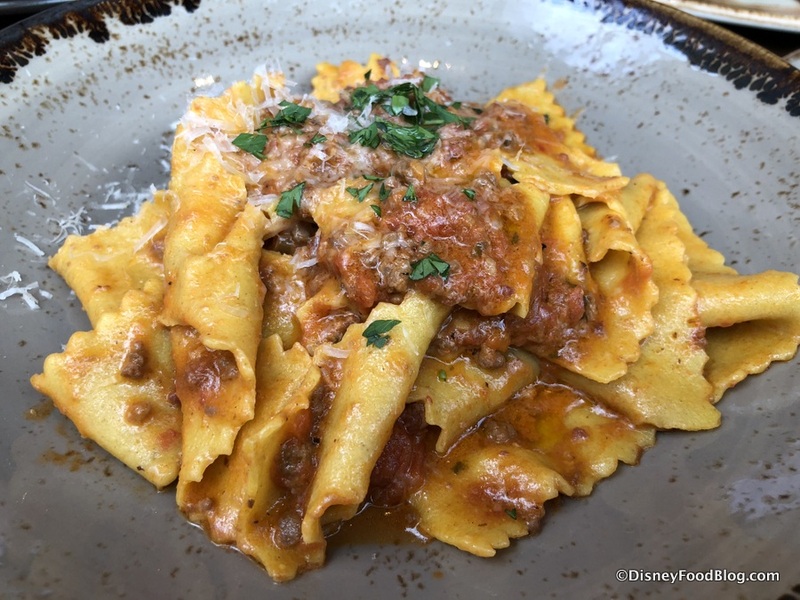 And the Pappardelle is topped with a rich bolognese meat sauce and ricotta salata. 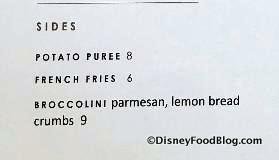 Honestly, both of these pasta dishes can hold their own against several Disney restaurants that specialize in Italian cuisine. 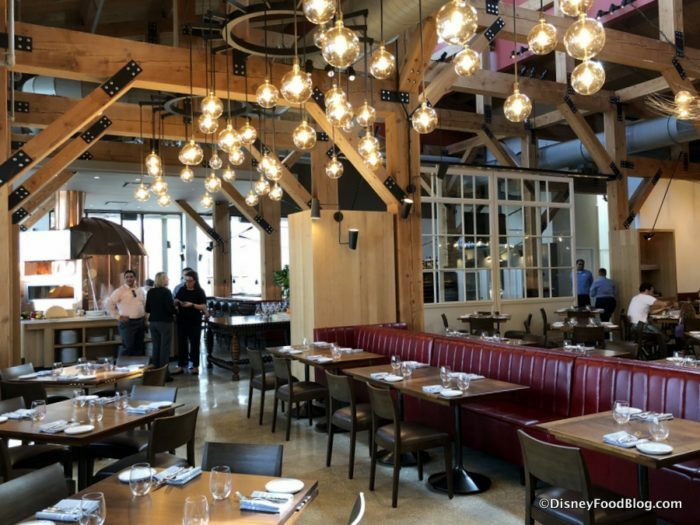 We had the chance to speak with the Chef — who comes to the Disney Springs location from one of Chef Puck’s Las Vegas restaurants and has been working with him since 1999 — about what made the pasta so memorable. 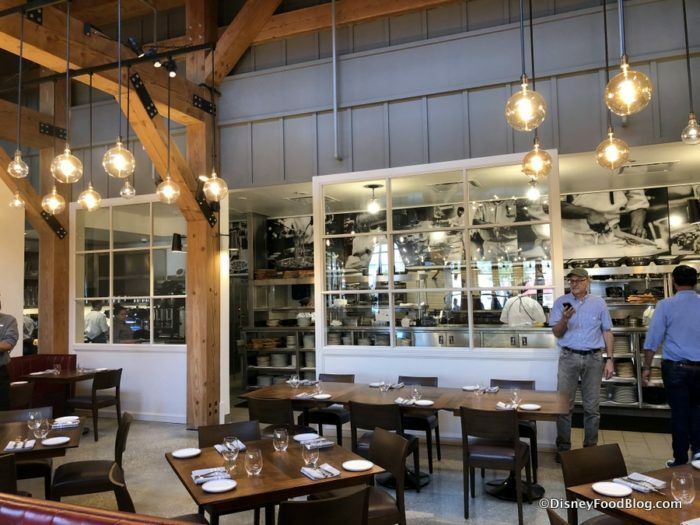 He shared that it was the focus on local sourcing of ingredients; in particular, he found a really good local egg farm, and it’s the fresh, healthy yolks that lend that yellow hue to the noodles. 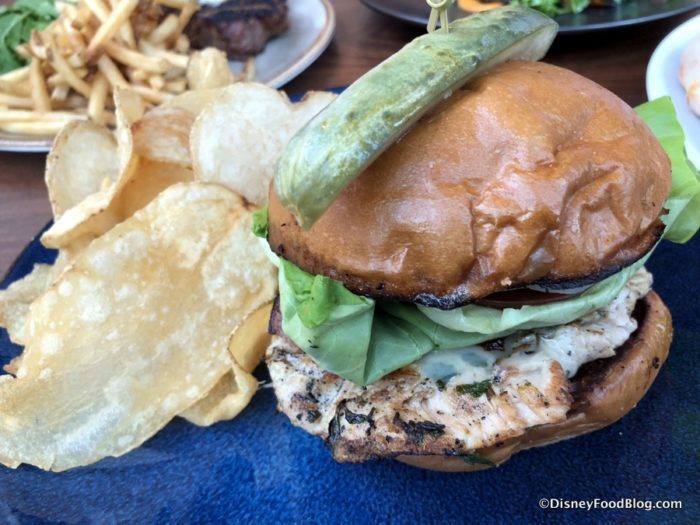 From the Sandwiches, I chose to try the Grilled Chicken Sandwich… which, I know, sounds pretty ho-hum. But, let me tell you, that was NOT the case at all! 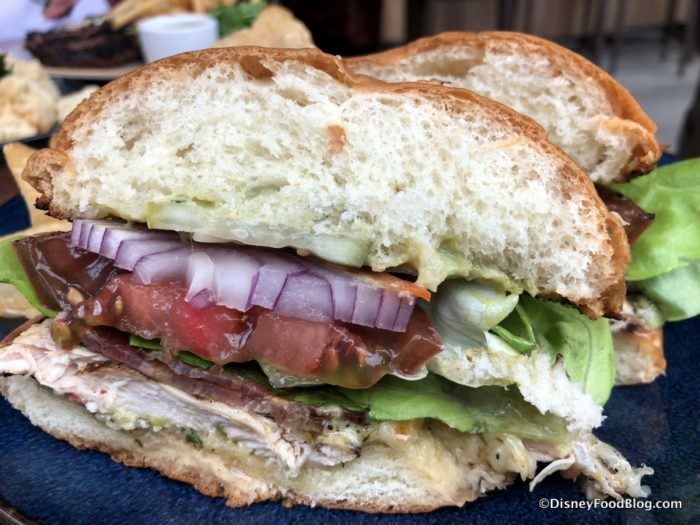 Topped with avocado, bacon, white cheddar cheese, tomato, red onion, and pesto aioli, this thing was packed with flavor. 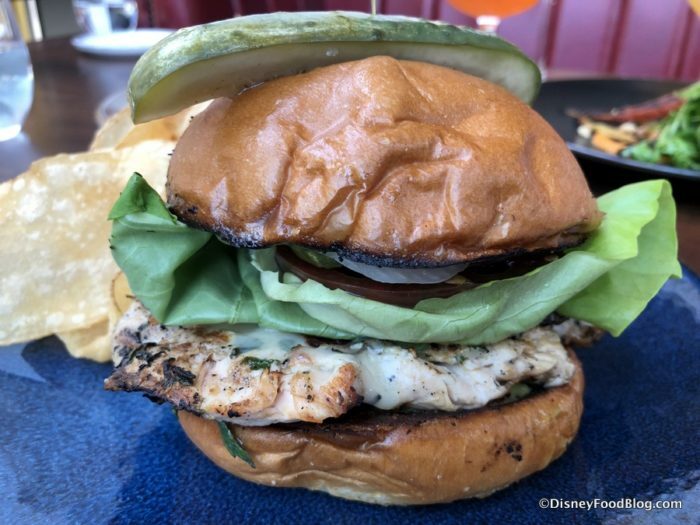 It’s hard to believe I’m saying this about a simple chicken sandwich, but those fresh toppings over the tender and slightly charred chicken (and bun, even!) left me impressed. It was really the pesto that made all the difference! Speaking of impressed (Spoiler Alert! 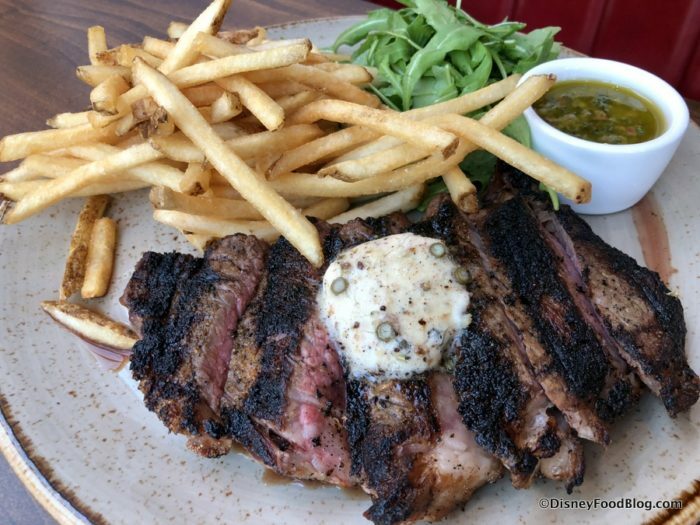 )… here’s a look at the Mesquite Grilled NY Strip Steak Frites. Charred on the outside and medium rare, the strip steak — which is served with a green peppercorn sauce — rivals some that I’ve had at proper steakhouses in Disney World. Awesome. Did you think we’d skip dessert? Nope! 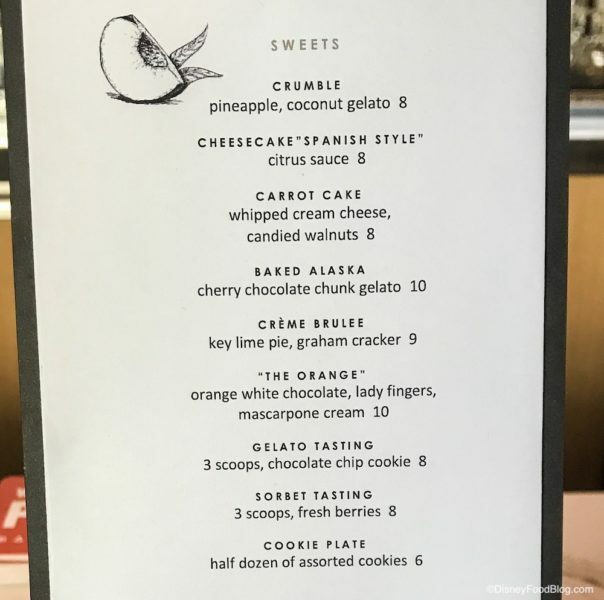 Wolfgang Puck Bar & Grill‘s dessert menu was thoroughly tempting. 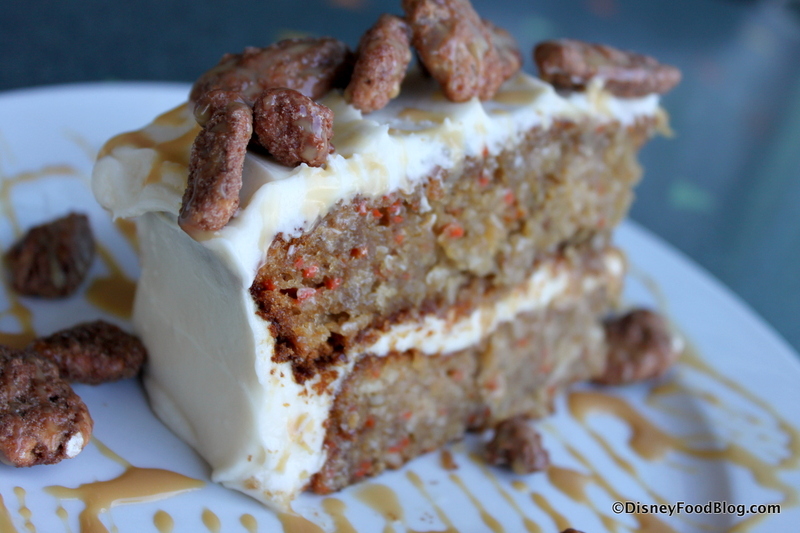 And this is the new Carrot Cake. This version is topped with candied walnuts. 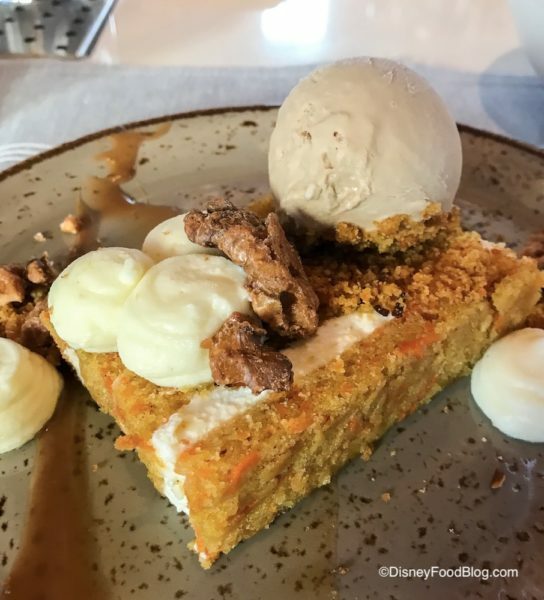 While we were sad to find it wasn’t as amazing as the old version, it was still a really nice carrot cake. The cake was fluffy, the whipped cream cheese icing was light and not too sweet, and the salted caramel gelato on top? So good. Next up: the Creme Brûlée. This version was key lime pie flavored with graham cracker crumbs sprinkled over the top. 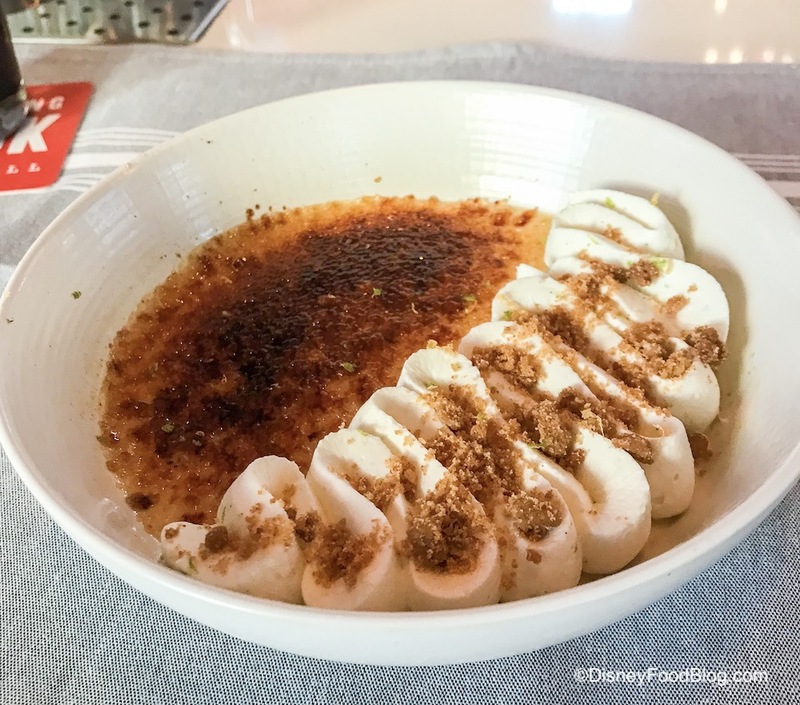 If you love key lime pie and creme brûlée, you’ll enjoy this. 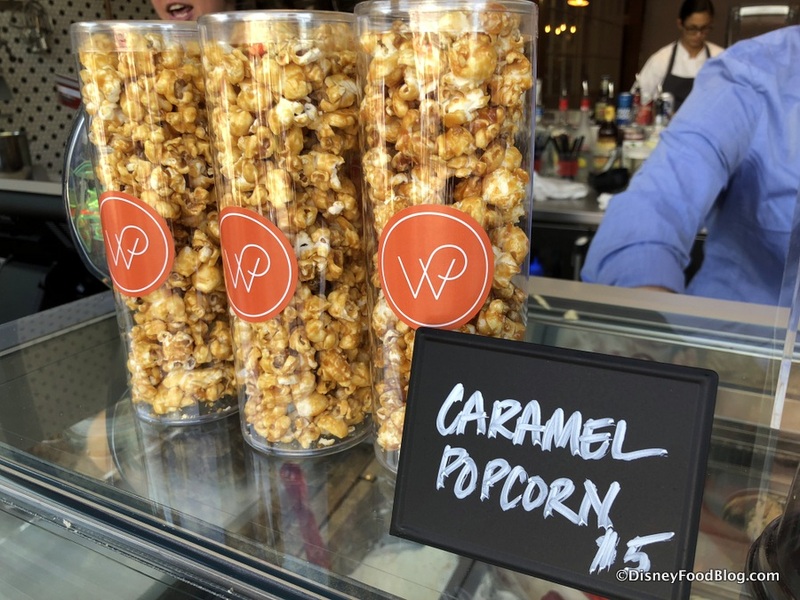 It was the perfect combination of both, and check out that cracked sugar! 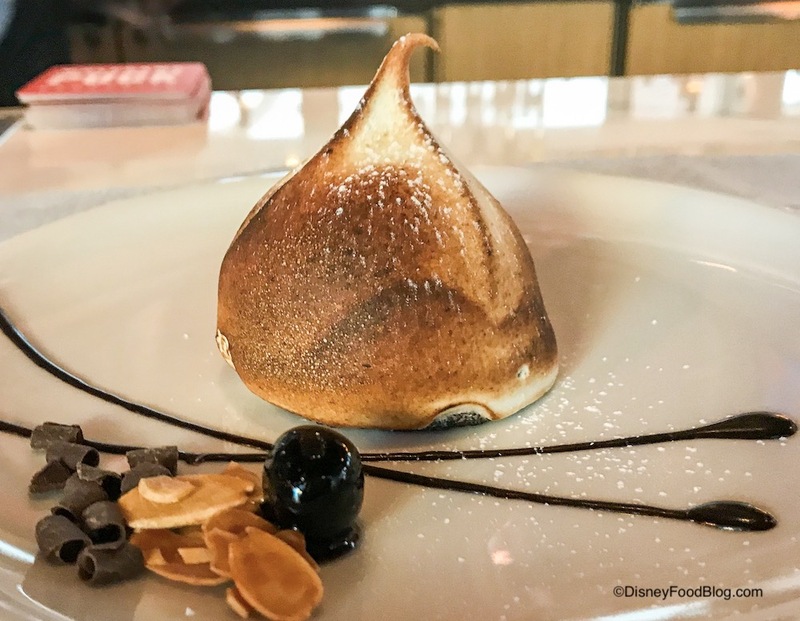 When we saw the Baked Alaska on the menu, we couldn’t leave without trying it. 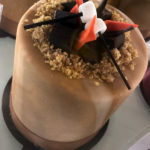 This version features layers of chocolate cake, chocolate cherry chunk gelato, chocolate gelato, and toasted meringue. It was warm on the outside and ice cold on the inside. 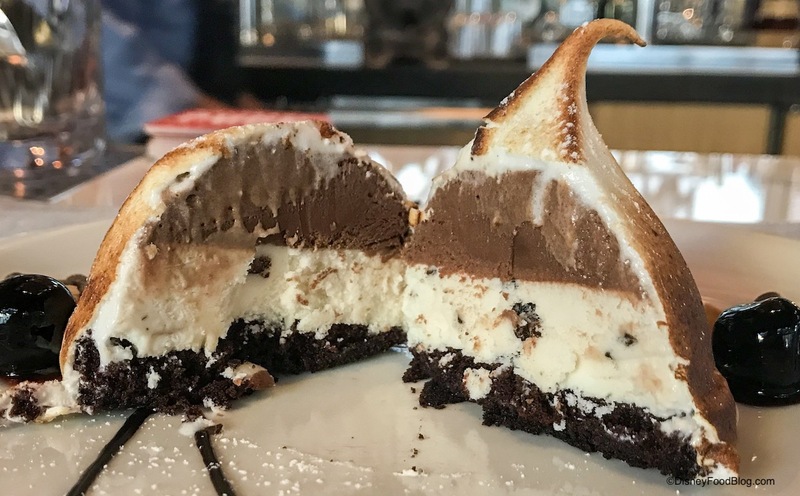 While the Baked Alaska is small, the presentation was dramatic and the flavors were robust. The menu didn’t list it, but we definitely tasted a hint of espresso in the cake. The chocolate and cherry definitely dominated the overall flavor. If you like a rich dessert with strong coffee, cherry, and chocolate flavors, give the Baked Alaska a try. So, even though there were a couple of lowlights, there were definitely more highlights overall in regards to food. The service was okay. It was acceptable, but when I was late for another appointment and needed to pack up the food to take it with me, the wait was extensive to make that happen. And now, let’s step outside for a little dessert! 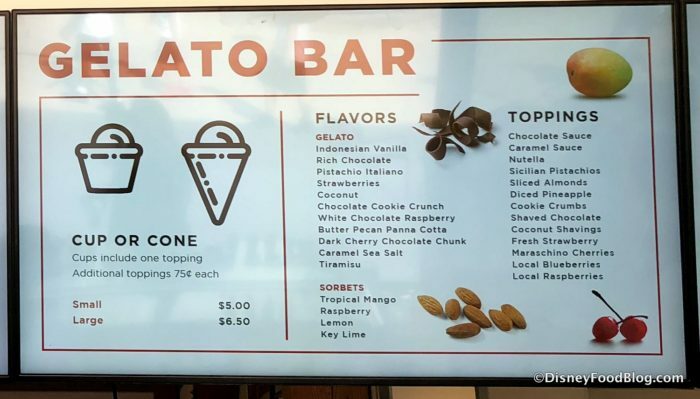 Because, as mentioned above, the Gelato Bar and Baked Goods are served at a walk-up window. 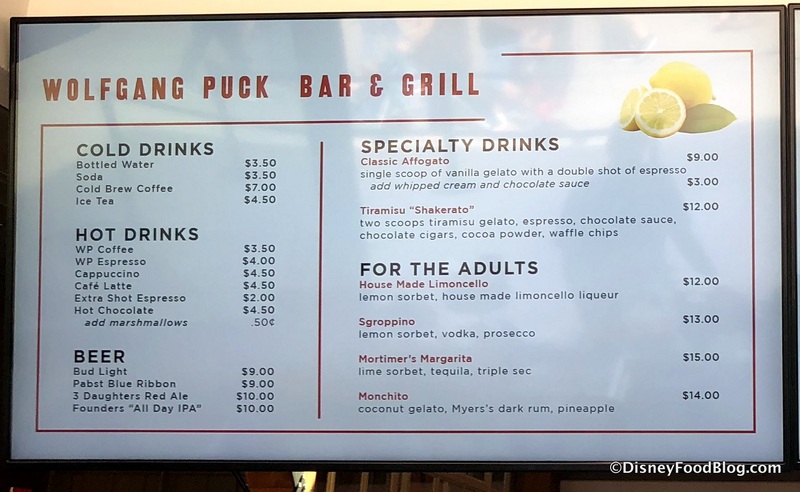 And while it’s become fairly standard for the newer Disney Springs restaurants to provide some sort of Quick Service component alongside their table service restaurant, I think the Gelato Bar and Bakery at Wolfgang Puck Bar & Grill may draw more lines that most, for more than a few reasons. 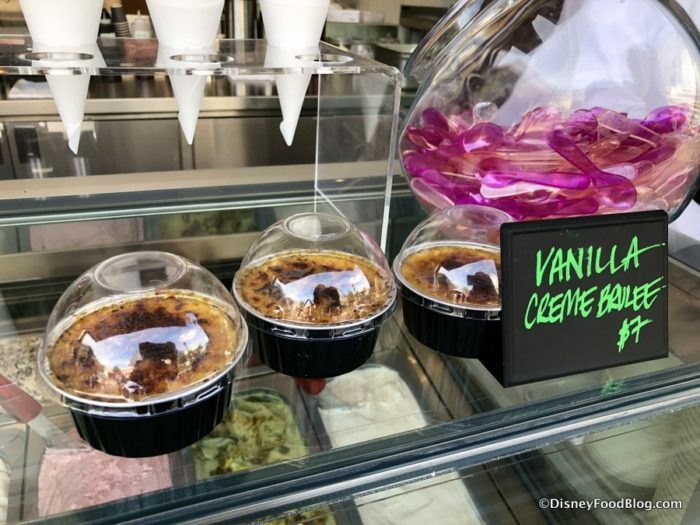 First, the Gelato selection itself serves up fun flavors like Butter Pecan Panna Cotta and Dark Cherry Chocolate Chunk. 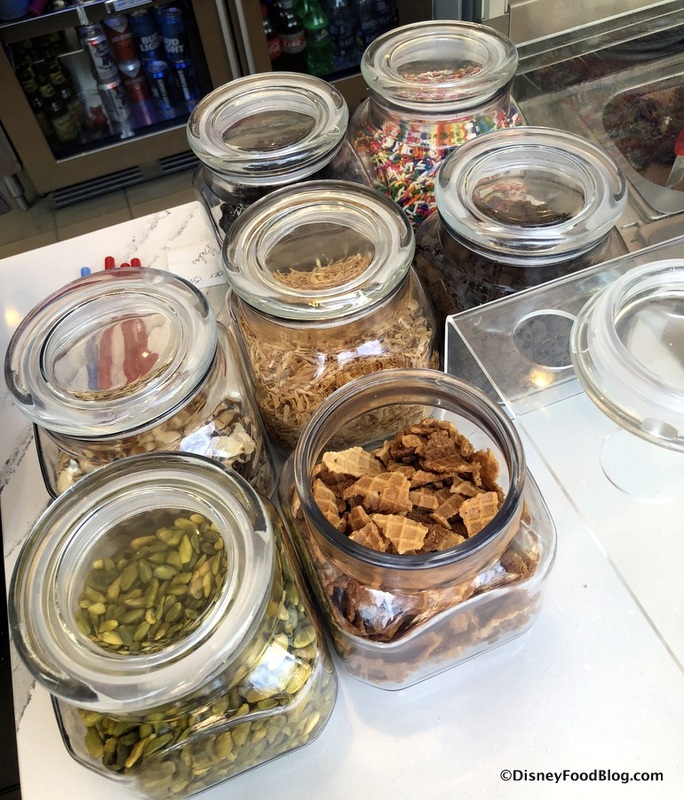 You receive one topping per cup, but can add others for 75 cents with options including sugar cone pieces, toasted almonds, and sprinkles. 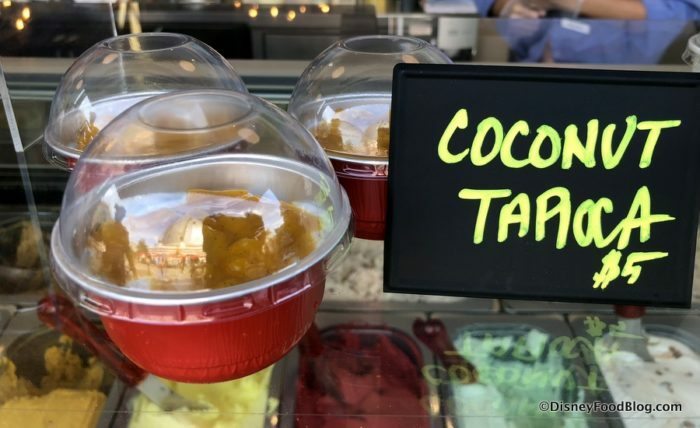 But you want to know my favorite thing at the Gelato Bar? 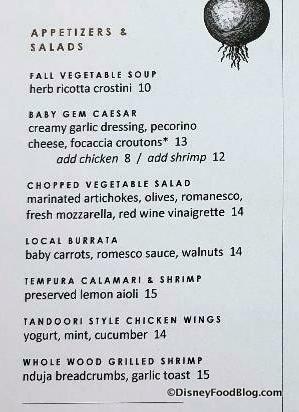 Check out the “For the Adults” menu below. 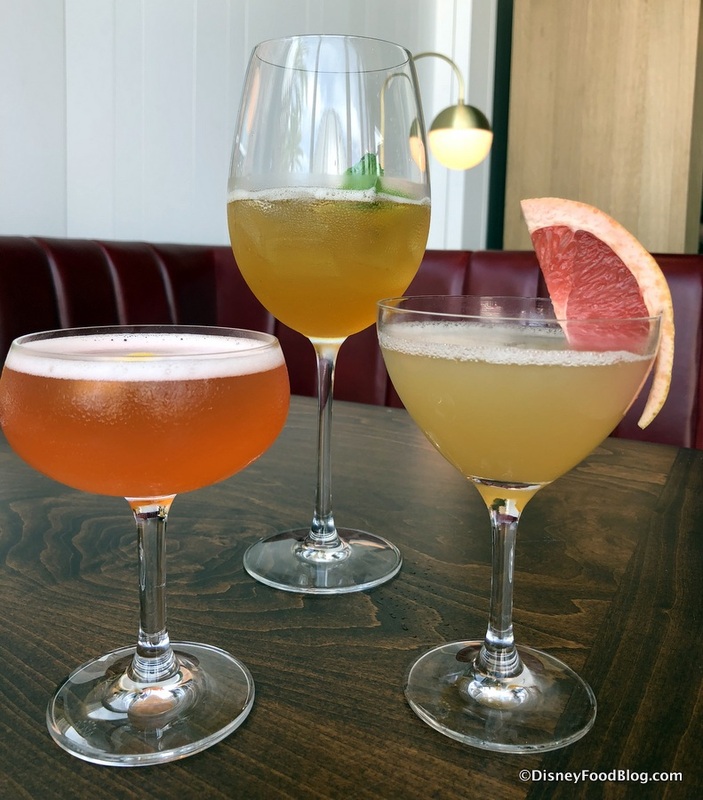 You’ll see four cocktails made with sorbet or gelato, like the House-made Limoncello with lemon sorbet, and the Monchito made with coconut gelato, Myer’s dark rum, and pineapple. My choice? 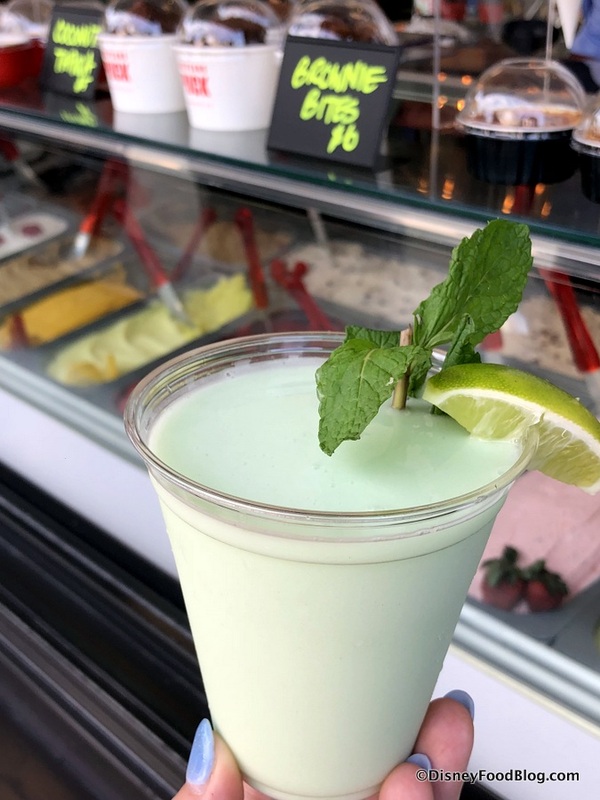 The Mortimer’s Key Lime Sorbet Margarita with tequila and triple sec! Oh, my… THIS. IS. INCREDIBLE. Sweet, tart, fruity, strong, and seriously smooth. And even though I thought this one was unbelievably good, my new goal as of today is to try all four, because I really don’t think you could go wrong with any of them. Do NOT pass up the chance to try one of these on your next visit to Disney Springs! And while you’re at it, be sure to check out the Grab and Go sweets! 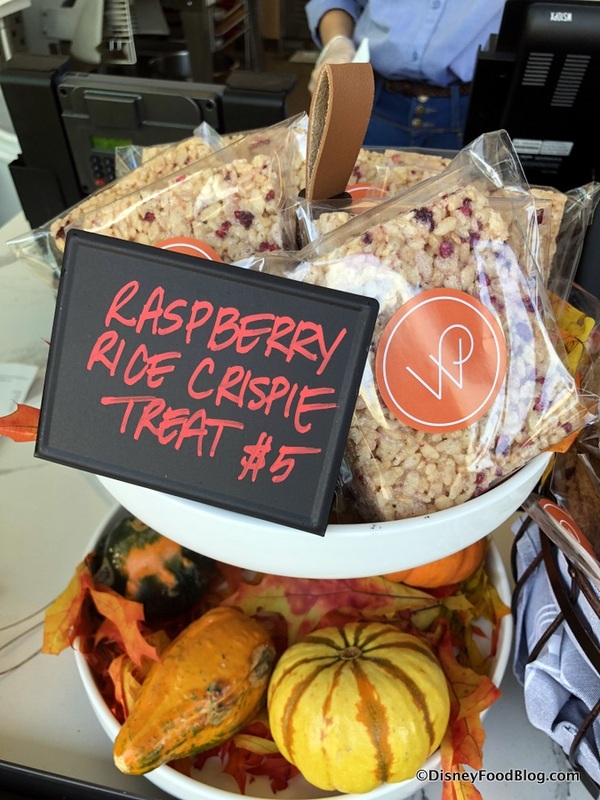 From Brownie Bites to Puck’s famous Creme Brulee to Raspberry Crispie Treats, they’ve packed a lot of options into a smaller space. 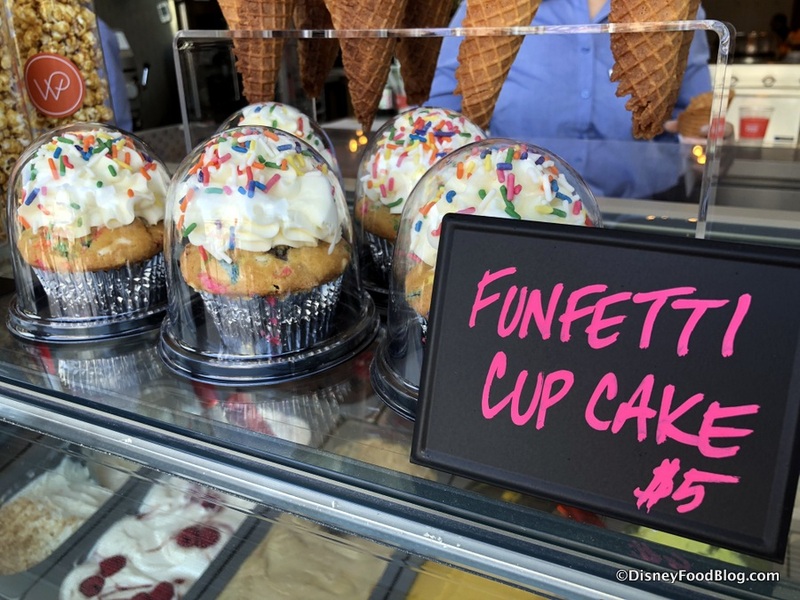 And check out the frosting scoops on the Funfetti Cupcakes! 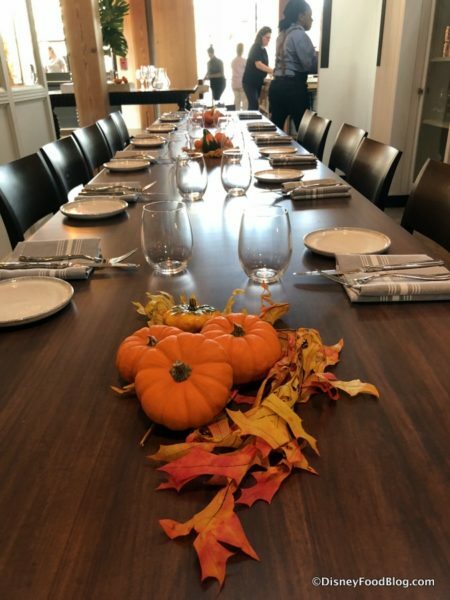 Your group would appreciate having a really nice amount of variety on the menu… not to mention fresh flavors. 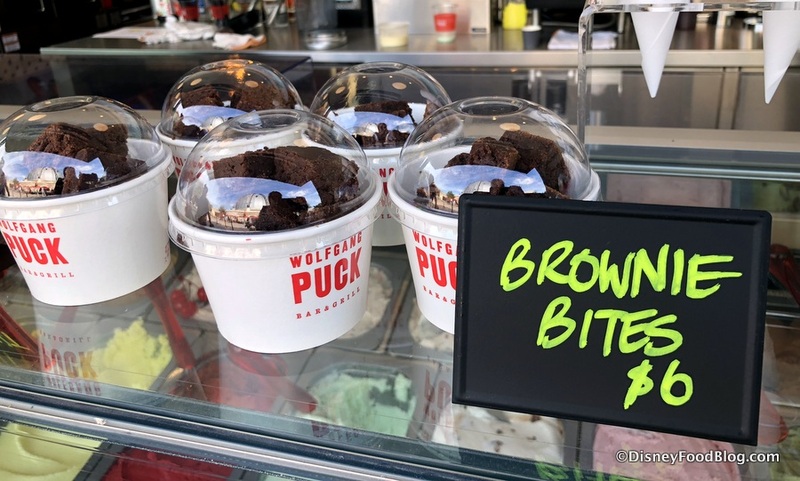 You’ve been a fan of Wolfgang Puck for a long time and can’t miss the latest venture. You can’t miss the sorbet and gelato cocktails now that you’ve heard about them! You’d rather opt for the quick service Wolfgang Puck Express to leave more time for shopping in Disney Springs. 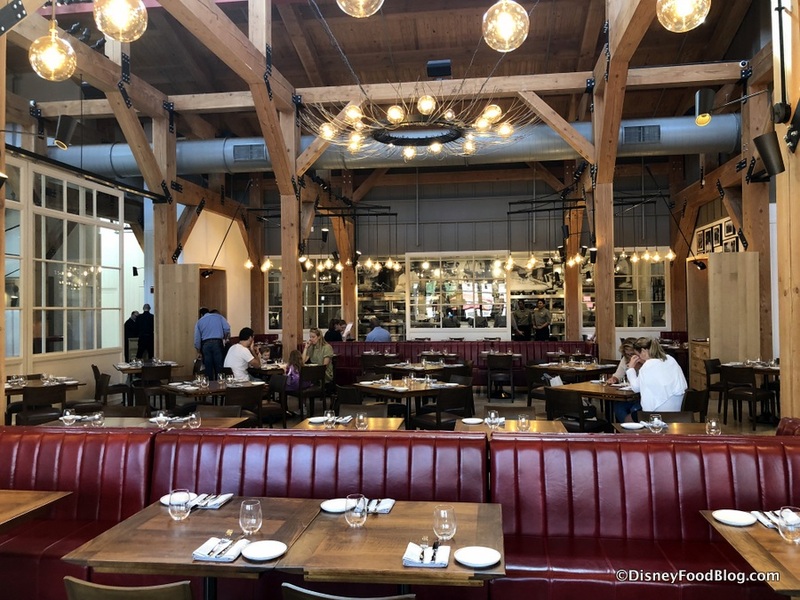 You live close to a Wolfgang Puck restaurant in your area and want to try the cuisine of some of the other celebrity chefs who have a presence in Disney Springs. Some info before we wrap! 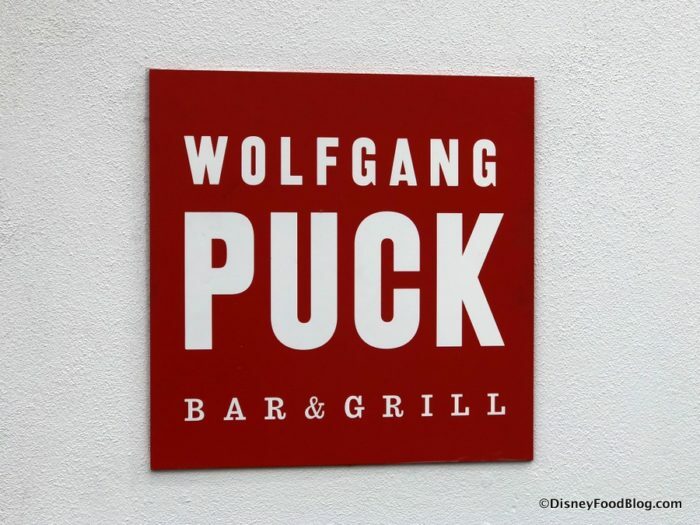 Wolfgang Puck Bar & Grill serves Lunch starting at 11:00 AM and Dinner starting at 5:00 PM. They are currently working out logistics to hopefully accept the Disney Dining Plan and Tables in Wonderland, but that has not yet been finalized (which is not unusual for opening days at a third party location). 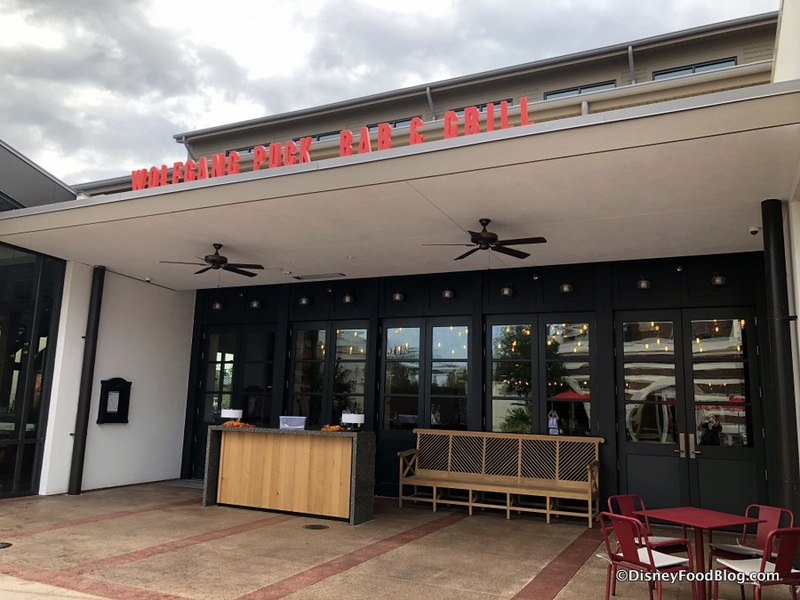 So, with that we are glad to welcome back table service from Wolfgang Puck in Disney Springs! Because there have been so many terrific additions in regards to restaurants owned by celebrity chefs to Disney Springs over the past few years — Morimoto Asia, Chef Art Smith’s Homecomin’, and Frontera Cocina by Rick Bayless, to name a few — one might anticipate that visiting the Wolfgang Puck Bar & Grill might have a feeling of “been there, done that” to it. But not at all! 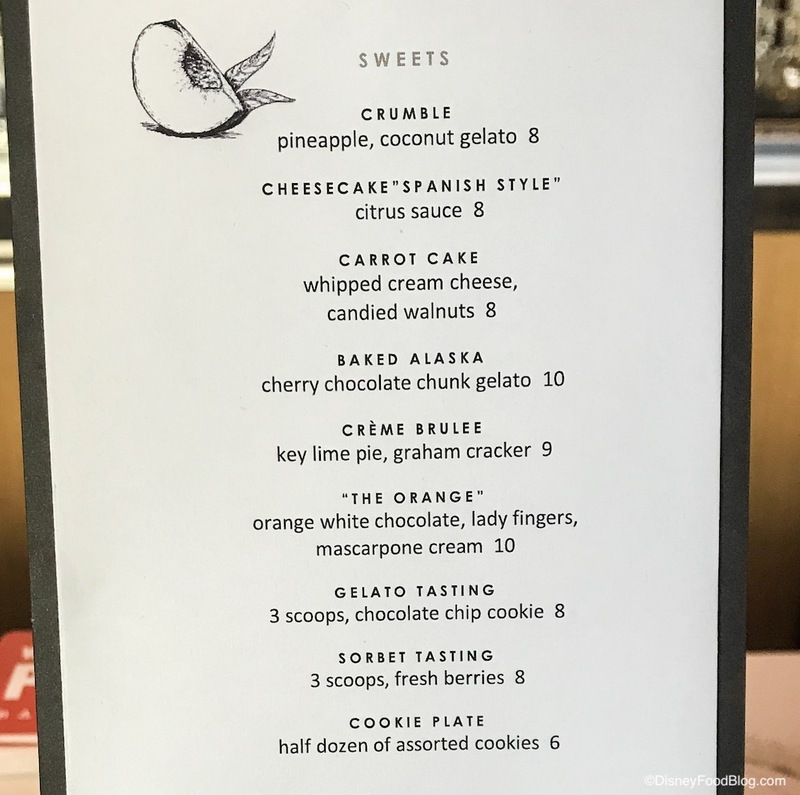 From the really fresh look of the new establishment to several very well prepared dishes (and, yes, those Gelato Cocktails! ), the new Wolfgang Puck Bar & Grill stands as a another great addition to the dining scene in Disney Springs. Well done, Chef Puck! Wolfgang Puck Bar & Grill is located in the Town Center of Disney Springs. 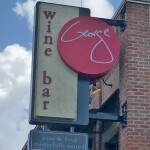 Check out Chef Puck’s neighbors in our DFB YouTube Food Tour of the entire area! 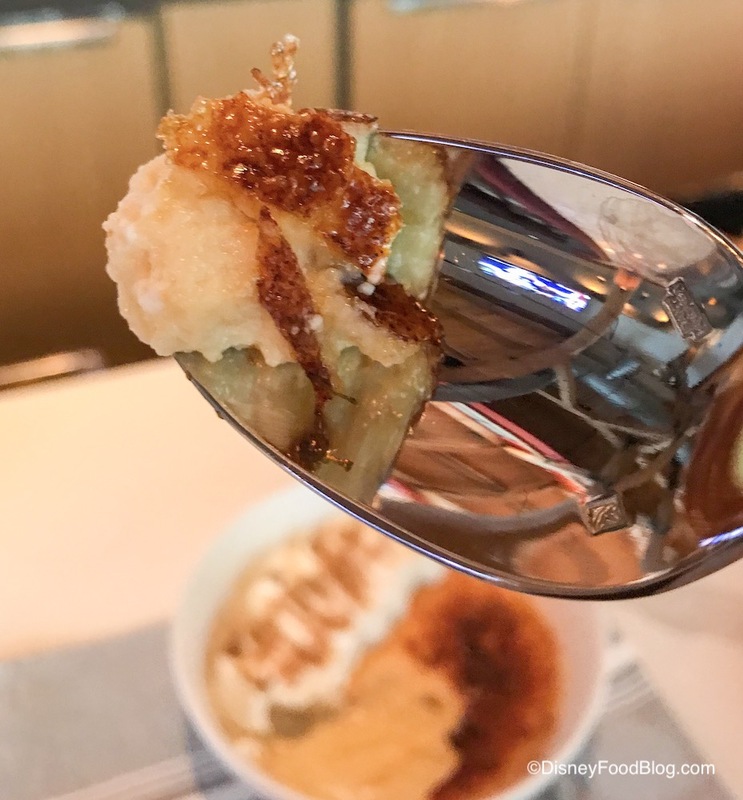 Are you planning to dine at Wolfgang Puck Bar & Grill? Please let us know with a comment! 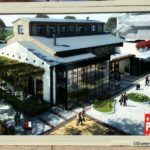 So how much of the food is handled in the Cafe Vs the full restaurant? I really want to try the Tandoori wings but dont really need to drop a dime on the rest of the food here. AJ, Great info as always! Just thought you might want to let whoever types up the blog know that “egg yokes” is actually spelled “egg yolks”. They sound the same so it’s easy to misspell. Hope that’s helpful. I’m happy to see they open at 11:00 AM and not 11:30. As soon as I saw the Pumpkin Ravioli…the reservations were made. 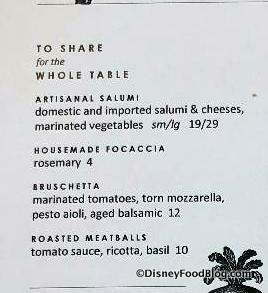 The old WP Cafe used to be a must do every trip just for the ravioli but then they removed it from the menu. It had pine nuts rather than the hazelnuts but either is fine with me. Looks pretty much the same otherwise. 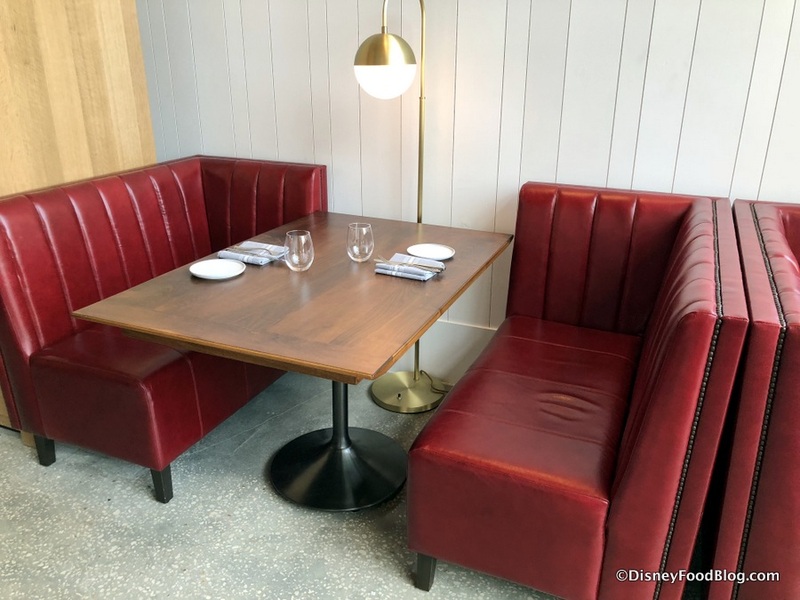 Just a question I’ve noticed on some of these blog posts it won’t show when something is eligible for a discount is there an ongoing list for tables in wonderland as well as annual pass holders etc? I’m guessing if this is new it doesnt have disocunts right away?